You influence change in the health of your patients. That is why they have sought you out. The tools you use to test, monitor, and educate them are essential to your relationship with your patient and to the success of your treatment plan. How are you measuring the health of your patients? Lab testing is valuable, but do those tests measure how resilient the patient is? Or how hard their body works to maintain balance? Are you measuring the influence diet, sleep, and stress have on their health? How are you monitoring the effectiveness of your protocols or the modifications you make? How do you know when a patient is ready for a change? Are they strong enough for a major adjustment, or do you need to take it slow? Do your patients understand the goal? Do they know what that looks like? Are they engaged in the learning process? Are they motivated to see and feel change? We believe the BioDézyne™ Equilibrium Report will answer these questions. This non-invasive, 5 minute test with an easy to read dashboard and an easy to understand report wins the compliance and partnership you both are looking for. What is stressful for one person may or may not be stressful for another person. Stress usually shows up as an emotional state of tension. Which is why many times people do not take it seriously. But it is also physical as well because of the physiological and hormonal changes caused by stress. If left untreated, excessive stress can lead to unhealthy and potentially serious consequences. It has been said that up to 90% of all doctor’s office visits are for stress-related ailments and complaints. These include frequent headaches, high blood pressure, heart palpitation, diabetes, skin conditions, asthma, arthritis, depression, anxiety, hormone irregularities, digestive disturbances, immune dysfunction, pain, and inflammation. The effects of stress can be measured and monitored with the BioDézyne™ HRV, a non-invasive technology using Heart Rate Variability (HRV). HRV data is an extremely accurate indicator of well-being. In fact, according to the opinion of many world-recognized experts, HRV is the most reliable prognostic indicator of a variety of chronic disease conditions, providing insight on the aging process relative to inner balance and optimum performance. HRV testing with Transformation’s BioDézyne™ HRV device is therefore an excellent clinical tool to track and improve health, fitness, and stress while detecting and preventing upcoming problems. Non-invasive, and can be performed in just 5 minutes. Can be performed without removing any clothing or gowning the patient. Includes a full RSA training device with variability built into the training sequences. Heart Rate is the number of times a person’s heart beats per minute. The BioDézyne™ HRV measures resting heart rate and color codes the dashboard Green, Yellow, or Red. ANS Balance. The BioDézyne™ HRV offers a clear, easy-to-read representation of Autonomic Nervous System balance. This simple piece of data is invaluable when assessing stress levels and determining how the body is responding to care and returning to balance. Tension Index. TI, also known as Bayevski Index, named after a Russian scientist considered by many to be the father of modern HRV analysis, represents the body’s adaptability to internal and external stressors. This represents the level of stress the body is experiencing at the present time and the fatigue or activity level of the body from a cellular level. It exemplifies how hard one’s body is working to stay in autonomic balance. The lower the number, the more adaptable a person is to stressors. The BioDézyne™ HRV utilizes a patented algorithm that depicts TI. One of the key time-domain HRV parameters, TI shows influence of central brain structures (hypothalamus, subcortical, and cortical areas) on heart rhythm. SDNN measures the body’s resilience of the individual’s activity over time. The higher the number, the better resilience, and vice versa. This reflects all the cyclic components responsible for variability in the period of recording, therefore it represents total variability of the patient and is of paramount importance in assessment. Most, if not all, other HRV devices that are not utilizing 24-hour monitoring cannot report SDNN. Algorhithms. The BioDézyne™ HRV converts the raw data into useful and precise algorithms that can then be stored for comparison and patient charting. Most HRV devices only report raw data which is virtually useless in a clinical situation. 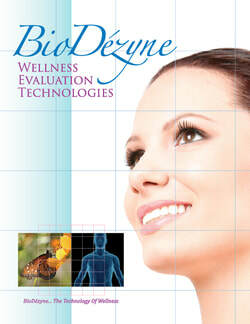 The BioDézyne™ Equilibrium Report provides you with an evaluation and assessment of the autonomic function. It is accurate, reliable, reproducible, yet quick and simple to measure and process. The Equilibrium Report will give you critical information to better understand your health and monitor the effectiveness of your therapeutic protocols. Click here for our most Frequently Asked Questions about the HRV.